Investment banks, law firms, private equity groups, and corporations, who need to share large volumes of secure documents. Easy to use, affordable, backed by 24/7 support -- you can trust Firmex Virtual Data Rooms to run mission-critical processes and get projects finished faster. 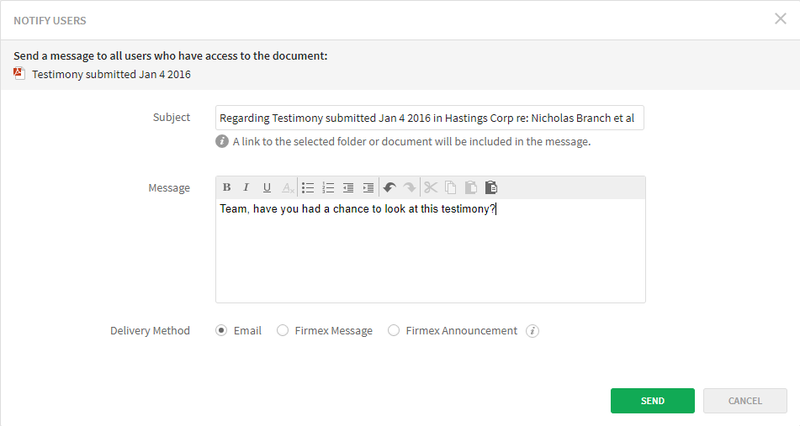 Over 120,000 companies have used Firmex to share confidential documents during mergers and acquisitions, fundraising, audits, litigation, and procurement projects with billions of dollars at stake. Firmex can have your project live within minutes, and every user has access to the same support as you do. No per page pricing or hidden fees. Firmex Virtual Data Rooms Reviews Recently Reviewed! Pros: The custom sharing platform which is secured and the visibility control for employees. The best part of software is the document validity & password we can set and the people we can choose from list that can access or view the documents. Also the same document cannot be shared by E-mail or any other non Data-room platform and if done. We can control the share and track of the confidential documents. Cons: The drawback of this software is that we cannot assign different permission or access levels to people in same group. Also, the time stamp cannot be changes to local time, it's always EST available. 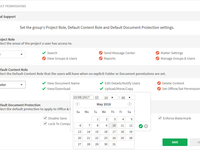 Overall: For the Real Estate and Investment banking, the sharing of confidential documents within the company and taking on projects being in a group has been made easier. The legal documents and the finances which cannot be exposed can be accessed and updated from anywhere with Login access, for example on my iPhone. Tracking old files is much easier, as we go through sharing hundereds of files everyday with corrections pointed and re-corrected. Thank you for using Firmex. We pride ourselves on our customer service and you having the best experience. 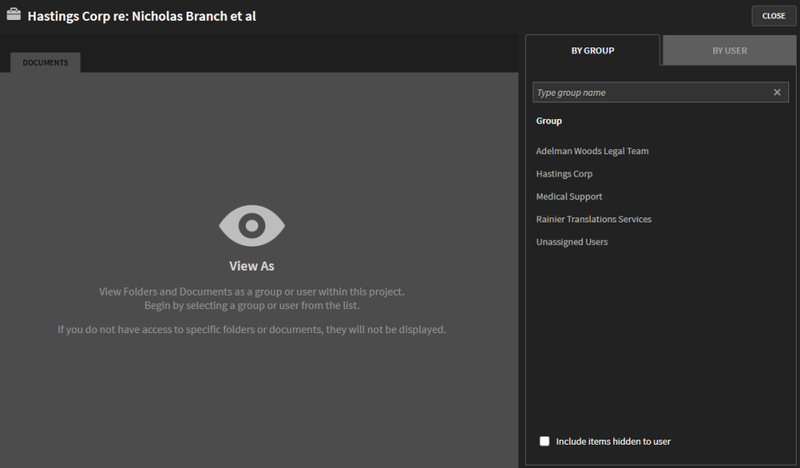 In the future, we would be happy to show you how to set user-based permissions in the data room. It's a function we have to set from our end, as group-based permission is the preference of a majority of our users, it's our default. In terms of time zones, increased functionality is on our road map. As it stands now all of our reports can be run at any time zone, be it est, your time zone, or anyone you choose. Happy to jump on a quick call at your convenience. 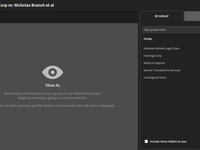 Pros: The functionality is perfect for running a VDR to share documents and files with many parties while controlling the document flow and accessibility of any party on any document. The product is very competitively priced compared to a lot of the service providers out there. Customer service is very prompt and happy to walk you through any issue, small or large. Firmex is also continually improving its services. Cons: Security functionality is limited once the files have been downloaded by another party (if you allow them to download). Once a party bulk downloads you lose the ability to track their access and usage of documents and delete the document if you would like to remove their access from the information completely. Overall: Our firm has used Firmex VDRs for dozens of investment banking transactions and are very pleased with the product they put out as well as the support and service we receive. Pros: Firmex is much easier to use compared to other VDR providers. It is very intuitive to use. Cons: The space provided for answering diligence questions is too small. When responding to a question it will help if the window expands with the answer, so that the user can view the whole answer rather than scrolling within the small window. Overall: Overall, experience has been good and can really recommend. Pros: Ease of use and functionality is the most positive attribute. Cons: Few cons, but select users have had trouble receiving Firmex automated emails due to spam filters. Overall: As a longtime user, I have only had positive experiences with Firmex. Pros: The software is intuitive. 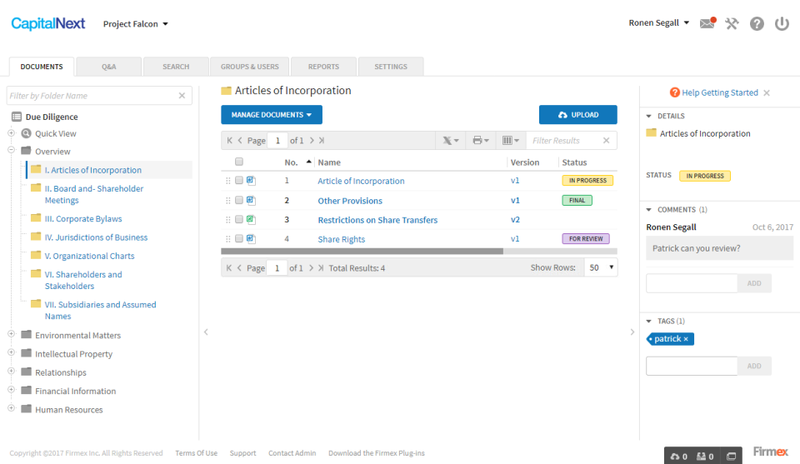 Cons: The search function does not allow for more advanced searches or searched within documents. Overall: Firmex is User friendly, but the search function could be improved. Sometimes the download speeds are slower on Firmex than other datasites. I typically batch download so I don't have to work on Firmex. 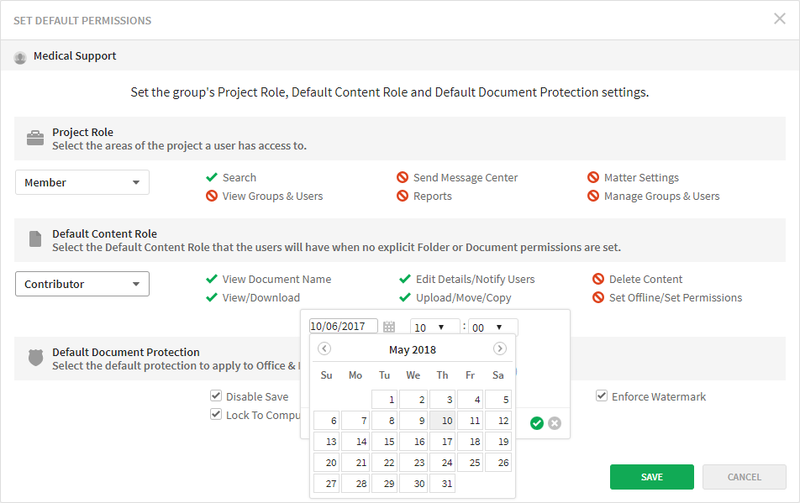 Pros: Ease of use, ability to control the permissions on documents, reports showing time of use and activity levels, etc. Cons: Sometimes difficulty with users not receiving their invitation emails, the inability to assign different permission levels to different members within a group. Pros: Ease of use, reliability of system, implementation of innovative new features with each update, and of course the excellent customer service. Overall: Firmex's customer service is truly exceptional. It's always a pleasant surprise whenever an agent replies to our questions and comments so quickly and efficiently. The system itself is amazing, and a joy to use. Recommendations to other buyers: If you are looking for a data room service, look no further, because Firmex is the best. Comments: We're using Firmex to exchange documents with law firms (e.g. when we did our public listing), as a repository for regulatory documents (drug submissions) and mainly, exchange documents with our multiple international partners (Spain, Germany, Finland, US). Our setup is simple: One project, one VDR. Simple access control and simple document management makes this solution optimal for us. We had to adapt to the new 'group' feature and got the hang of it. Not the most intuitive presentation of the features. Setting rights access is rather simple and intuitive. So is adding more users. Bulk edit features are also useful. 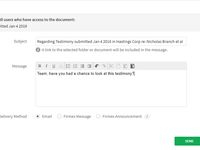 The recent addition of the Firmex Document Exchange for Desktop was also a good idea. One final note - the customer service team has been extremely efficient in the initial training and support. Problems are resolved extremely fast and this is critical for us. Pros: Very easy to use, fantastic customer service - rep. has been brilliant & always available if we have any issues at all. Also, very easy to create indexes etc. and very straightforward to upload documents. Overall we are extremely pleased with our experience. Cons: Timestamps on documents cannot be changed to local times, only EST is available. As we are based in Ireland, it would be a good addition if we can timestamp documents in GMT/BST. Cons: Lacks some functionality for the everyday user, which could be a good thing, depending on who's using the service. Glad you enjoyed using Firmex! We are always looking to improve our service and would love some clarity around your comments. Could you be more specific about what, if any, features you found lacking? A member of our client success team will be reaching out to you shortly to discuss your specific project. In the mean time please don¿t hesitate to contact our support team anytime (http://www.firmex.com/support/contact-support/). They will be happy to answer any questions you may have. Again, thanks for taking the time to review Firmex. We appreciate the feedback! Cons: Customer service, permission settings. Overall: I've used Firmex on one deal. The functionality was great, but customer service does not make it easy to assist with the VDR setup if you are not the Admin, but rather trying to assist your client/the Admin. Recommendations to other buyers: Data archiving is not a streamlined as other VDR services, but it's still very good. Thanks for taking the time to review Firmex. With regards to your comment, for security reasons we cannot change permissions that our clients set as the main administrators without their permission. It looks like this is what was happening in your case, but its hard to comment beyond that without knowing more specifics. Please contact me at jason.soo@firmex.com. I would love to learn more about your specific case, and how we can improve in the future. Comments: We've been using Firmex as our M&A VDR solution for about six years. The software subscription allows us the flexibility to use the VDR to accomplish different objectives (i.e. traditional M&A due diligence, data collection, large file transfer, etc.) as well as flexibility with respect to project length (i.e. clients that we'll work with for years prior to going to market). The two biggest pros in my eyes has been the constant improvements through the years and the friendly customer service. The company is always receptive to suggestions on how to make the product even more user friendly. Pros: It's aways easy to create and use. Very intuitive. Cons: Nothing to point out. I'm only using it very sparsly. Comments: The pros is this is an easy way to share documents and organize our deals and control who has access to them. It is secure and safe. The cons is I find it difficult with the new user groups to be able to do what we need as efficiently. If we were able to control this function by having the ability to turn it on or off, or create user groups with users from different companies that would be great. Also, the option to use a group that was already created would be great, as we normally have many of the same people going into one group. 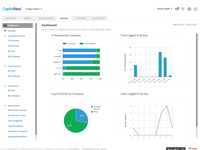 Great product for sharing information/data with high-caliber product support team. Ease of use. 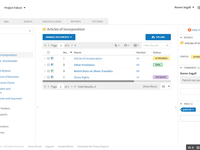 Great features/capabilities for sharing information and collaborating with both internal and external members. Very positive experience with usage of the software. Top notch support team with high degree of availability. Expend the concept of groups across the data room (currently project specific). Comments: Firmex is designed for personal customization to suit any project I have going and at any stage. I find it's overall easy to use, set up, upload and share. Being able to set up individual parameters for each user and for each room is vital to allow proper access at the proper time. Whenever I have a question or need help with something, the Firmex team is quick to respond and always friendly and professional. Comments: We used Firmex for 3 months during a sell side data room need. Software was very intuitive to configure and use. Our lawyers had comparative experiences with other pieces of software, and they said this is the best one they have ever used. I recommend Firmex for their tooling and attentive customer support. I requested it twice, and I was promptly supported. Comments: I am using a Firmex data room to compile tax forms for foreign beneficiaries. The forms are sent to one office, and I am in another. The data room offers a secure way for one office to file the forms and I can access them from another location. I get notified by email that new forms have been added so I am always in the know. Comments: Firmex is a great piece of software that we use daily in our financial institution. It makes sharing large amounts of secure data, easy, efficient, and foolproof. The drag and drop functionality makes this software as easy to use as your OS. This is a must have tool for anyone who shares significant volumes of documentation. Comments: We've been using Firmex as our M&A data room for over 5 years and I'm always impressed with the platform, the company's constant improvement, and the amazing customer service. If I ever have a question, I receive a call back within 3 minutes. Intuitive use and stand-up customer service keep me a satisfied customer. Comments: We have utilized Firmex as our primary extranet portal for years now and never are we disappointed by this platform. It is the epitome of user-friendly and the round-the-clock customer service is just another example of how efficiently this company manages their product and client-relations. Comments: Overall the platform that Firmex provides is much more robust and easy to use than the platform my firm was previously using. Firmex has nearly all of the functionality of the larger VDR providers at a cost that is a lot more reasonable to our clients. I would use this product again. Comments: The Firmex site is intuitive and easy to use. The staff was very accommodating and has helped us to design our project so that it meets our unique needs for personnel across the country to access documents. We have received outstanding customer service. Strong support and sales organization that listens and cares. Developing the system continously is important, but not losing track of the simplicity and iniuity is essential. Comments: I've used plenty of data room providers and firmex is on par with the other big names. None of them are perfect but I seem to have fewer problems with firmex especially when it comes to downloading large data rooms in one try. Comments: Firmex has a wonderful support team that takes the time to walk through each step with it's users. I called them often when I was first learning Firmex and was very impressed with their patience and knowledge. Comments: So far experience has been limited but very satisfying, it is extremely easy to use and functional, our internal parties and external users have become familiar with it quickly and are happy to use it. Comments: As a legal assistant, I'm able to set up a Virtual Data room in no time. It's easy to download documents and share information all across the country. I would highly recommend Firmex! Pros: Simple to use and logical in its layout and tools. Cons: The area for management of users and groups wasn't as logical and simple to use as the rest of the tool. 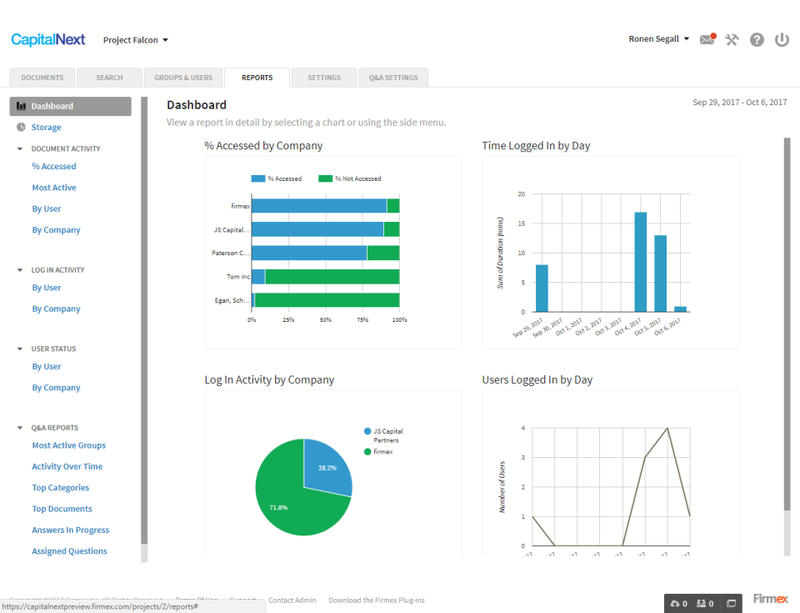 Overall: Extremely easy to use, organize data, manage and restrict users, and see what different users can view. It's very intuitive. Recommendations to other buyers: I've worked with many VDRs over the years. Use this one. Excellent tool for organizing info so that it is accessible by those who are permitted to use it. Comments: Pros: easy to navigate, can dowload files simply, is user friendly and intuitive, others can access info. Comments: Firmex was very user friendly and easy to use. The insiders website made it fun to use and learn more about the site. Comments: I love that support answers the call or call you back within a few minutes. Proven repeatedly.